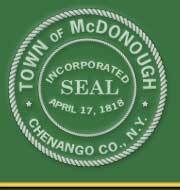 All roads in the Town of McDonough have been temporarily posted to exclude all vehicles with weights of 2 ½ tons per axle and over until further notice. This will be strictly enforced. CERTAIN TOWN ROADS CONSIDERED SEASONAL HIGHWAYS WITHOUT OCCUPIED RESIDENCE OR COMMERCIAL BUILDINGS WILL BE CLOSED NOVEMBER 1st TO APRIL 1st BY THE ORDER OF THE MCDONOUGH TOWN BOARD PURSUANT TO SECTION 205 HIGHWAY LAW. All vehicles left on town roads during highway plowing will be towed at the owners expense. The purpose of this law is to maintain the safety and general welfare of Town residents by regulating commercial activities that have the potential to adversely affect road right-of-ways.